There was plenty of talent at the very top of the NBA draft in 1974. For the first time since 1970, the Braves couldn't get any of it. Buffalo's winning record had put it right in the middle of the first round, picking ninth out of 18 teams. It had no chance at such players as Bill Walton, Marvin Barnes, Tom Burleson and Bobby Jones. Rumors surrounded the Braves at draft time that the team would select Tom McMillen with its first-round pick. The reason was an odd one: McMillen shared a hometown tie of Mansfield, Pa., with Buffalo owner Paul Snyder. The reasoning may have been faulty -- all involved denied that part of the connection -- but the pick came out as advertised. McMillen was a 6-foot-11 star from Maryland who could offer some depth at forward. The catch -- the Braves would have to wait a year for McMillen to fulfill an Oxford scholarship. Buffalo passed up some good talent for McMillen, including Keith Wilkes, Brian Winters, Truck Robinson and John Drew. A little help up front was needed, because the Braves had lost a member of their bench in the 1974 expansion draft. Bob Kauffman, the last original Brave, was taken by the New Orleans Jazz and dealt to Atlanta, where he played the last year of his career. Kauffman had an odd-looking career -- three seasons in the NBA all-star game, four seasons as a reserve -- but he'd be always remembered fondly in Buffalo for his efforts in those early years of the franchise. General manager Eddie Donovan completed one good-sized transaction in the offseason. Buffalo sent Matt Goukas and two second-round draft choices to the Chicago Bulls for Bob Weiss. It was a deal involving two future NBA coaches. Weiss was a third guard behind Norm Van Lier and Jerry Sloan on some very good Chicago teams of the early 1970's. 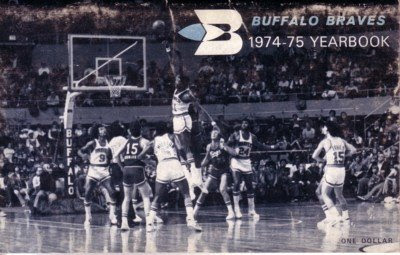 Buffalo also purchased Dale Schlueter from Atlanta, a center who could take up space and give McAdoo a breather. Was it enough to keep the building process going? Milt Northrop of the Buffalo Evening News didn't think so. "I think where the improvement stopped was that they stopping building the backup strength on the roster," he said. "After they make the playoffs in '74, they had a decent pick, the ninth pick, and they drafted Tom McMillen. ... They weren't in a position where they could bank a player. They needed rebounding help off the bench." But the starting lineup was the same, and for more than a month it looked as if that nucleus was going to blow down the NBA. Buffalo opened the season on Oct. 18 with a win in Boston, its first ever. On Oct. 29, DiGregorio tore the cartilage in his knee badly enough to miss more than half the season. Even so, the Braves lost a game in Portland on Nov. 1, and then won 11 straight games to move to a 15-3 record. Buffalo looked like the sports capital of the nation at that point, what with the Sabres headed for their best-ever season and the Bills on their way to the playoffs. All three teams were in first place that November. "The team had matured, and solidified to a certain extent," Ramsey said. "Ernie's knee injury was critical as far as his career was concerned. In my opinion, he did recover from that time, and didn't play the caliber of basketball that he did in his rookie year. But team-wise, we recovered quite well." In part, that's because McAdoo wouldn't let the team collapse. He turned in an even better season than his 1973-74 campaign. Just as an example of the year, McAdoo set a team record with 52 points against Boston on Feb. 22, and 51 against Houston on Mar. 22. He also averaged a league-leading 43.2 minutes per game, which he said didn't wear him down. "I was out to win," McAdoo said. "I wanted an NBA championship. We weren't deep at center, so Jack Ramsey had to play me. We had to have our top five out on the court, so I was playing 44 to 46 minutes per night." DiGregorio was replaced in the starting lineup by Kenny Charles, as Weiss wasn't up to the task of starting at that point in his career. Charles wasn't up to DiGregorio's standards offensively -- who was? -- but he was a much better defensive player. That changed the Braves' approach. Helping the backcourt was a step up by Randy Smith. "Randy had been growing each year of his professional experience, and he added to take on added responsibility," Ramsey said. "It made him do things he hadn't done as well. He worked hard, he practiced hard, and he achieved a great deal." Injuries also hurt a bit up front. Jim McMillian missed 20 games with an appendicitis and Gar Heard missed 15. Jack Marin filled in at small forward, and Donovan acquired Jim Washington from Atlanta to add a little depth. The Braves also lost their general manager during the season, a very odd event. Donovan returned to the Knicks in March of 1975 after a dispute with Snyder. The Braves filed tampering charges against New York, but that didn't go anywhere. Donovan eventually came back to Western New York in 1986 when he took a job as a vice president at St. Bonaventure. The Braves didn't need a general manager at that point in the season. It was time to get ready for their second straight playoff appearance, earned with a 49-33 record. If anyone could get them past the powerful Washington Bullets, McAdoo could. He led the league in scoring again (34.5 ppg, the peak of his career) and was named the league's Most Valuable Player and a first-team All-Star. McAdoo and Smith were the only Buffalo players to play in all 82 games. But DiGregorio wasn't going to be part of that playoff effort. Ramsey had benched him during the last month of the regular season. "It definitely hurt. There's no question about it," DiGregorio said. "As far as the coach not believing in the things I could do, that didn't help matters. I think I was the kind of player that you either loved me or hated me. If they thought I could do it, they'd go with me. With Buffalo, when I came back, the team established a pattern where the coach wasn't going to break me into that lineup because they were winning. That was his perogative." Average home attendance jumped to 11,397 per game that season, and they were ready for the series with the Bullets. The Braves got the jump by winning the opening game in Washington, 113-102 ("We were absolutely terrible. The only sure way to keep McAdoo from going to the basket is to put a bomb in his car when we get to Buffalo," said Bullets' coach K.C. Jones at the time), but lost at home, 120-106, two nights later. The teams traded home victories for the rest of the series. McAdoo provided a highlight when he scored 50 in Game Four. "When Mr. McAdoo gets hot all you got to do is give him the ball and get out of the way. Nothing's easier. We could be down by 50 and if Mr. McAdoo gets hot we'll get back," Charles told Sports Illustrated. The Braves were a game better than the 1974 edition, but it still wasn't enough. Washington didn't need any last-second dramatics to take Game Seven, 115-96, due in part to a 13-point first quarter by Buffalo. Now the Braves had to figure out how to get over that first-round hump, and find someone who could help them do it.